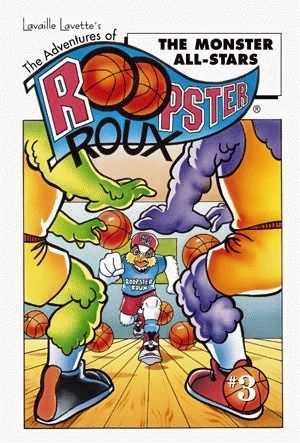 Roopster Roux will have to use his brains as well as his b-ball skills if the Vikings are to beat the Monster All-Stars in a Halloween game in this, his third thrilling adventure. Tegore, disguised as a wealthy philanthropist, tricks the Woodville mayor into signing a contract that will pit the Vikings against his Monster All-Stars. The mayor is excited because, if the Vikings win, the Woodville library will receive $1,000,000. Roopster, however, reads the fine print and discovers that if they lose, then everyone will have to pay Tegore a reading tax of ten cents a word! The Monster All-Stars seem unstoppable. Late in the game, Roopster realizes that the monsters love to laugh at riddles, but can that help the Vikings win? Brent Barry of the Miami Heat playfully narrates this exciting and funny adventure. Not only does he know how to play basketball, but he also knows, like Roopster, that a good riddle can be as valuable as a good dribble.